A high search engine ranking is a very important web marketing goal; websites compete for specific keywords and key phrases to achieve the highest ranking possible. When beneficial content is seasoned with industry keywords and proper Search Engine Optimization (SEO) mechanics, a website is elevated over its competition. Benefit-driven content and SEO mechanics are necessary to a competitive web presence and attract customers. Build a persuasive customer experience. …more. A Content Management System (CMS) allows special access and editing privileges – to a website’s page content – through a browser window. The experience is much like creating and sending an email through a browser window. Photos, videos, text can be upload, and composed to fit special content areas. Access to the CMS is password protected and granted on editing confidence. 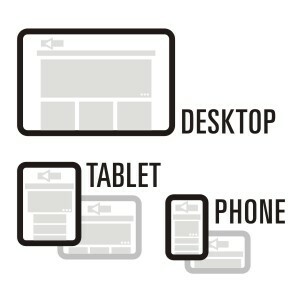 A “responsive” web design redistributes web page content to display on a smart phone, tablet, or desktop browser window. 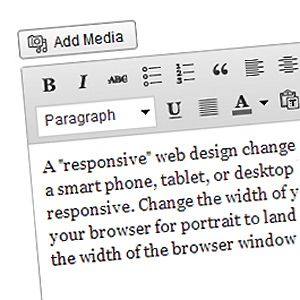 The words you are now reading are in a responsive web design. Resize the width of the desktop browser, or maybe, rotate your tablet or smart phone from portrait to landscape – the same web page content is redistributed to fit the width of any browser window. One design fits all. Brand Graphic Standards are the blueprint for brand presentation. Everyday, brands of the world are being interviewed – by a consuming public. How does your brand dress for that interview? Brand presentation should be a consideration. If a “website” is the face of your brand, then reason permits, a “trademark” is the birth-mark – on the face of it. As with most faces, age will show with time. Twenty-five percent of all small to medium size businesses fail after their first year; 36% after the second year. There is no single reason for the “fail” rate. Mistakes are made. All enterprises plan to succeed when they start – some, fail to plan. New customers, new product orders, new service orders are generally considered necessary to a successful business. An advertising budget is about new orders, new sales.